A bright Perseid meteor streaks over the Stellafane observatory in Springfield, Vermont on Aug. 7, 2010 during the Perseid meteor shower. The potentially dazzling meteor shower will reach its peak in the overnight hours tonight, and you can watch it live online - courtesy of NASA - if bad weather rains out your view. The annual Perseid meteor shower will be at its best late tonight (Aug. 12) and early tomorrow, with the best time to catch the celestial fireworks display coming at 2 a.m. EDT (0600 GMT). 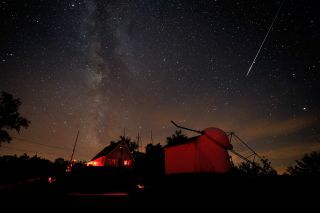 NASA will host at free webcast of the meteor shower beginning at 10 p.m. EDT (0200 GMT) on NASA TV. You can also watch it live here on Space.com. You can watch the Perseid meteor shower webcast here, courtesy of NASA. The webcast will feature commentary from meteor experts from four NASA space centers, as well as the American Meteor Society. If the meteor is large enough, it may leave a train of glowing particles in its wake, which usually fades within a few seconds. Meteors do not have tails; this misconception comes from confusion with comets, which move far more slowly and do have tails. A comet is visible for weeks or months, whereas a meteor is gone in a second or two. This sky map shows the radiant of the Perseid meteor shower from the constellation Perseus in the northeastern sky during the meteor display's peak on Aug. 12 and 13, 2015. The Perseids appear to radiate out from a point on the border of constellations Perseus and Cassiopeia. Meteoroids are distributed throughout the solar system, so it's possible to see a meteor on any night in the year; these are called "sporadic meteors." But there are some greater concentration of meteoroids, usually moving in the same orbit as a comet or asteroid that has gradually lost material along its orbit. The Perseids are associated with Comet Swift-Tuttle, which was discovered in 1862 and last observed in 1992. It will next be close to Earth in 2126. When the Earth passes through a concentration of meteoroids, it produces a greater number of meteors, called a "meteor shower." These meteors may appear anywhere in the sky, but if you trace their paths backwards, they will all appear to come from a point in the sky known as the "radiant" of the shower. If you look straight at the radiant of a meteor shower, you will see the meteors appearing to come toward you and passing by on either side. Because of perspective, the meteors will tend to be short in length and brief in time. If you look well off to the side of the radiant, the meteors you'll see will be longer. Because of the direction the Earth faces moving through space, you will usually see far more meteors after midnight local time (1 a.m. daylight-saving time). With the radiant of the Perseids in the northeastern sky of North America, the best directions to look are southeast and northwest. Better still is to lie on your back and look straight overhead. Many people misunderstand what the term "meteor shower" means. It is a slightly higher frequency of meteors coming from a particular radiating point. On a night without a shower, you will see perhaps five meteors an hour if you watch continuously. At the peak of the Perseid shower under very dark country skies, you should expect to see 90 meteors an hour if you concentrate on looking straight overhead. That's about three meteors every 2 minutes. This year's Perseid shower is particularly good because the peak falls just after midnight local time for observers in the eastern half of North America, and the moon is close to new and doesn’t rise until after 5 a.m. It's important to dress warmly, since even in summer the temperature can drop quite low after midnight. I usually wear winter clothes and lie back on a deck chair so that I can see close to overhead. It's important to spend at least 20 minutes under a dark sky so that your eyes get fully adapted to the dark. Don't bother with a telescope or binoculars, as these take in too little sky. Your best equipment to see meteors is the plain old human eye. An interesting project is to equip yourself with a star chart of the direction you plan to observe, and then to plot the meteors you see on that chart. (Use a red flashlight so you don't lose your dark adaptation.) If you observe continuously for more than an hour, you should be able to confirm that the radiant is in Perseus. The Perseids also provide a great opportunity for photography. Point your camera toward the northeast, and leave the shutter open for at least a minute. Do this several times in succession, and you're almost certain to catch a few Perseids. As always, we would like to see your pictures. If your area is clouded out on the night of the peak, try again over the next few nights, as the Perseids have quite a broad peak. Editor's note: If you snap a great photo of the Perseid meteor shower and want to share it for a possible story or gallery, send images and comments in to managing editor Tariq Malik at spacephotos@space.com. This article was provided to Space.com by Simulation Curriculum, the leader in space science-curriculum solutions and the makers of Starry Night and SkySafari. Follow Starry Night on Twitter @StarryNightEdu. Follow us @Spacedotcom, Facebook and Google+. Original article on Space.com.